Tonight was a special treat. 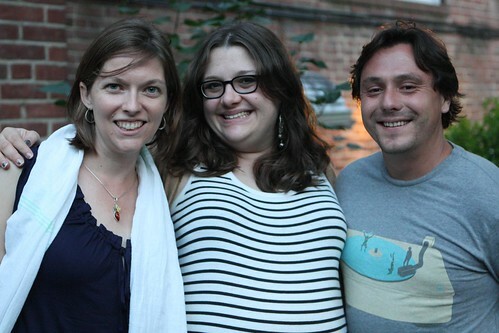 We got a last minute visit from our friends Katherine and Sylvain whose wedding we attended last summer in France. Since this was Sylvain's first trip to America and an extremely rare visit from the couple I was intent on putting together a shoddy American meal to try to sweeten the bitter taste that America had undoubtedly left in his mouth. 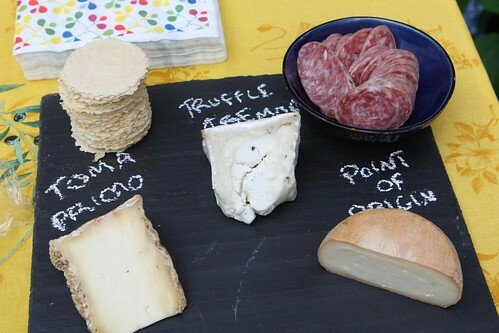 I started off with a showing of American cheese, two from New York and one from California. Representing New York were the Toma Primo and the Point of Origin which was washed in Sixpoint Diesel beer. 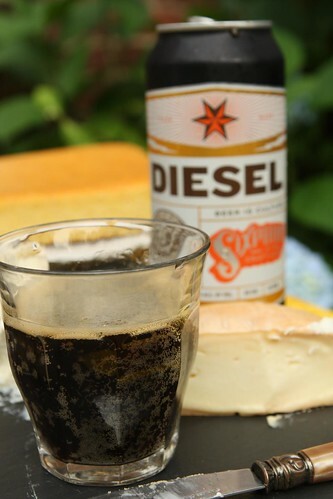 To get the point across I was able to secure a little Sixpoint Diesel (which is getting a bit hard to fine these days) and pair it with the cheese. From California we enjoyed the Truffle Tremor which was probably my favorite of the bunch. Sorry, New York, I'm a sucker for truffles. 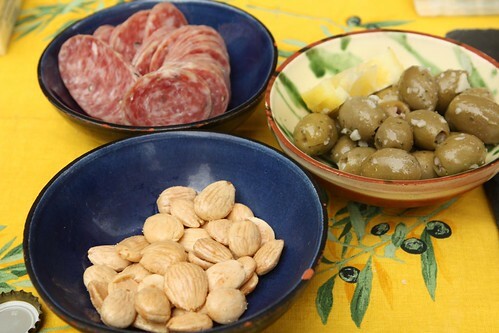 Additionally to enjoy as a warm up to dinner we had some Chestnut Valley Toscano sausage with lemon garlic olives and Marcona almonds. 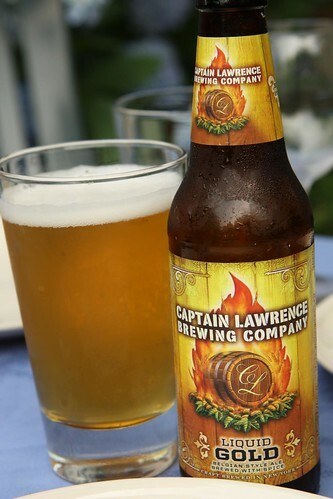 Along with the Sixpoint Diesel and Captain Lawrence Freshchester Pale Ale we also had the Liquid Gold from Captain Lawrence Brewing Company. I also shared a bottle with the main course which shared a name with my favorite Elvis Presley song . . .
That's right . . . a clambake! 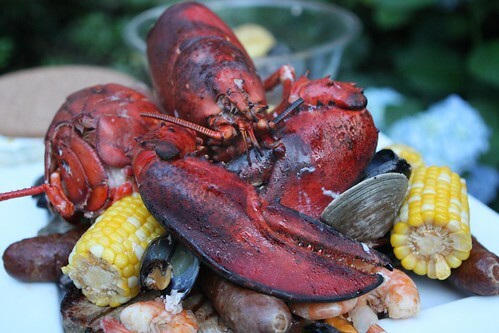 I tossed onions, potato, beer, mussels, littlenecks, Andouille sausage, and lobster in to a pot on the grill and cooked them until they were done. My super happened to be grilling this evening as well and even donated some steak to the dinner. I served this all up with drawn butter and cornbread in hopes of achieving maximum East Coast Americana. Overall the dinner was pretty successful but, food aside, it was just nice to see our friends who we rarely get a chance to hang out with short of an intercontinental journey. 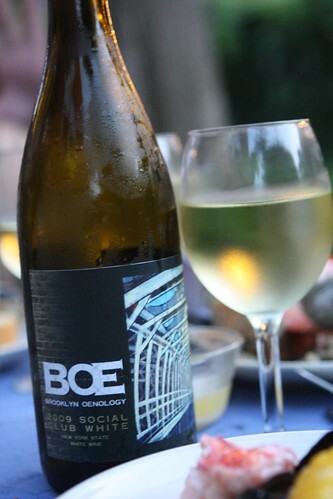 After beer we opened this bottle of 2009 Social Club White from Brooklyn Oenology to pair with the clambake. With all the fantastic foods available to the French I wanted to expose Sylvain to the best possible American food, for better or worse. This was a very nice white wine. I think Brooklyn has done America proud with this offering. I had a lot leftover caramel corn and caramel sauce from Jen's New York baby shower and, thankfully, last night I decided to turn it into a dessert by making it into ice cream. 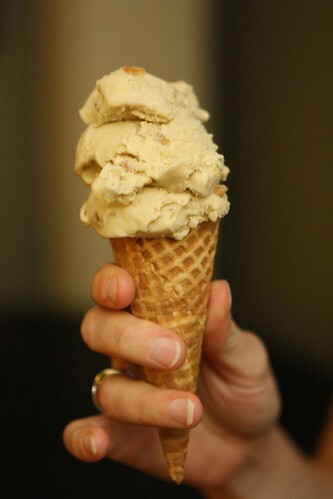 I can scarcely think of anything more American than caramel corn ice cream. I've never actually seen this anywhere before but I'm sure it's been done. I heated up some cream and milk, tempered it with some eggs, then mixed it together with the caramel sauce (complete with bits of popcorn and Marcona almond) then chilled and processed it in our ice cream maker. The result was a salty, sweet, tasty ice cream which went nicely in an ice cream cone. The only thing that could have made this dessert more American would have been to serve it between two batter-fried chicken breasts. Oh well. There's always their next visit.